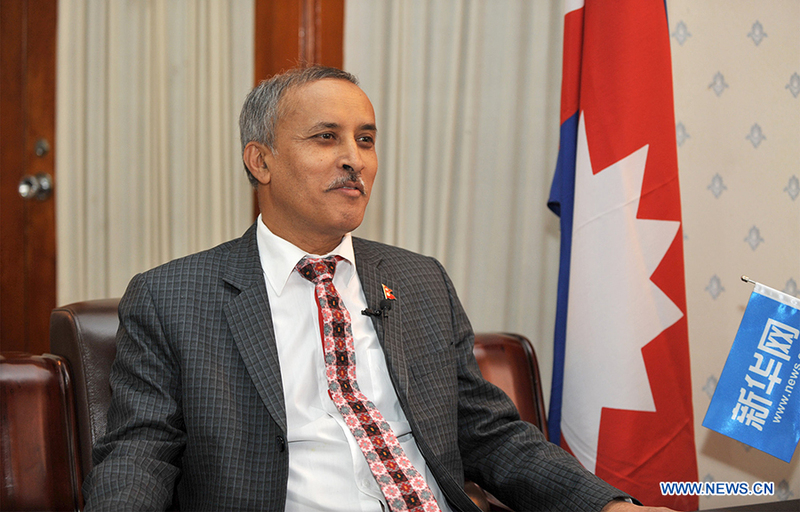 BEIJING, March 5 (Xinhuanet) -- "China's development is opportunity for us," Nepali ambassador to China Leela Mani Paudyal said in a recent exclusive interview with Xinhuanet. This year marks the 70th anniversary of the founding of the People’s Republic of China. The miraculous advancement China has made over the 70 years is unprecedented and historic, he noted. Of this, the pace and magnitude of its infrastructure development is highly impressive, the ambassador added. As an example, he said, China's high-speed rail network now accounts for 60 percent of the global total and the technology is still advancing rapidly to increase the speed, improve comfort and enhance safety. China has also set an example in poverty elimination, he said, adding that the world wants to learn and benefit from this example. Given the large population of China, the ambassador is amazed by China's agricultural production capacity. The ambassador said China's rapid expansion of agricultural production has not only improved the living conditions of its people, but also contributed to global food security. Equally impressive is the development of science and technology in China. He noted that China is rapidly coming up in 5G development, big data, and space science and technology. On the Belt and Road Initiative, the ambassador stressed, it promotes connectivity, people-to-people exchange and win-win cooperation. "After joining the Belt and Road Initiative, we have significantly enhanced the level of cooperation, " he said. Nepal has been getting a lot of resources and expertise and human resources development opportunities, he added. The second Belt and Road Forum for International Cooperation will be held in China this year. The ambassador said that Nepal wants to further expand cooperation with China in different areas to further enhance the level of cooperation.